August 31, 2011  Muslims are marking the end of the fasting month of Ramadan. For Libyans, the holiday has a special resonance this year because of the rebel takeover of Tripoli, the capital. August 30, 2011  Many of Libyan leader Moammar Gadhafi's family members have turned up in Algeria. It's not known if Gadhafi is with them. The Algerian Foreign Ministry said in a statement that Gadhafi's wife Safia, his sons Hannibal and Mohammed, and his daughter Aisha entered the country across the land border. 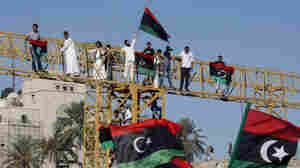 August 29, 2011  In Libya, the tide has turned against Moammar Gadhafi and his supporters. And that has left an uncomfortable question for the new rebel authority: What to do with his loyalists and supporters? August 26, 2011  One of Moammar Gadhafi's last major strongholds in Tripoli has fallen to rebel forces. Among the survivors of the ferocious street fighting are prisoners from the Abu Salim prison, some of whom have been jailed for more than two decades. August 25, 2011  In Tripoli, Libyan rebels are continuing to battle Gadhafi loyalists in parts of the city. The Abu Salim district just south of Gadhafi's former compound has been the focus of the heaviest fighting, and there is speculation that Gadhafi — or one or more of his sons — may be holding out in the district. August 24, 2011  Libyan rebels appear to hold most of the capital, but they face the difficult challenge of imposing order while battling remnants of Moammar Gadhafi supporters in Tripoli. August 24, 2011  The regime of Libyan leader Moammar Gadhafi continues to crumble. 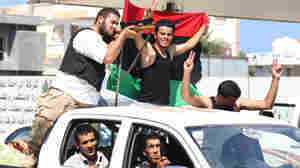 On Tuesday, rebels stormed Gadhafi's compound in the center of the capital Tripoli. August 22, 2011  The rebel charge into Libya's capital on Sunday made it appear that the collapse of Moammar Gadhafi's regime was immient. But NPR's Lourdes Garcia-Navarro ventured into Tripoli on Monday and found a city that was still hotly contested. August 22, 2011  It appears to be just a matter of time before the rebels take complete control of the capital. There are reports of heavy fighting near Moammar Gadhafi's compound but there is no sign of Gadhafi. August 19, 2011  The Libyan rebels have been making major advances in recent days, and their triumphs include the takeover of an important city south of Tripoli. Moammar Gadhafi is looking increasingly vulnerable. August 19, 2011  In Libya, rebel forces have made advances in their battle to unseat Moamar Gadhafi from power. 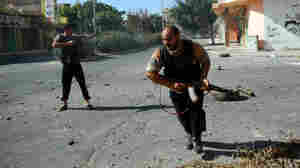 After several days of fierce clashes, opposition fighters have taken the last refinery under Gadhafi's control. The coastal city of Zawiyah, 30 miles from the capital tripoli, is still being contested though. August 17, 2011  As opposition forces make gains in the key coastal city of Zawiya, Moammar Gadhafi's forces are battling back, trying to prevent a full rebel takeover. With more fighting expected, many civilians are fleeing the country's Mediterranean coast.